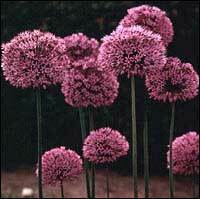 Ornamental Onions, grown for their exotic flowers, are members of the large onion family. They have many characteristics in common with their edible cousins--onions, leeks, chives and garlic, particularly their bulbs. While certainly not as popular as tulips or daffodils, there are the 2 dozen or so kinds of ornamental onion Alliums available for the garden. They are perennial, being able to survive cold winters and flower year after year. Giant Onion (Allium giganteum), a dramatically tall type with large ball-shaped flower heads, is most commonly available and makes a wonderful garden accent. The flower stalk of giant onion is from 3 to 5 feet tall. The foliage is only about 1 1/2 feet high and may cover an area up to 2 feet across. Giant onion's tiny pinkish-purple flowers crowd together in a dense, globe-shaped cluster at the end of a tall hollow stalk. Each cluster is from 4 to 6 inches across, creating a spectacular sight. They may be lightly fragrant. Giant onions bloom in late spring or early summer and last up to 3 weeks. The flat, hollow, strap-shaped leaves of giant onion grow from the base of the Allium and are about 2 inches wide and 18 inches long. They are blue-green, about the same color as the culinary onion. Crushed, they exude the familiar onion odor. After the Alliums finish blooming, the foliage dies back.